I'm sitting at work, getting ready to start the day and I'm hearing Chicago for the THIRD time this morning. As I was moving around the radio dial in the car today, I heard the closing of "If You Leave Me Now," switched to another station and heard "Feeling Stronger Every Day" and now, it's "Beginnings." 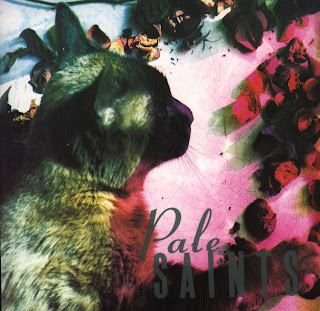 Of all the bands that either played music that paved the way for shoegazer, and of all the bands on 4AD not to achieve some level of iconic status, the Pale Saints qualify as a really overlooked band. I should qualify that statement by admitting that I only own their debut album, The Comforts of Madness, but I've played it a lot in the 18 years since it came out. And it's one of those albums that stays near the turntable for about a week when it gets pulled out. Plus it has a kitty on the cover, as you can see here. They were quite a bit more rock than many bands of that period on 4AD, but they had those pretty choir boy vocals over top of the charging wall of guitars. I also like the fact that almost all the songs segued together and that many had interludes of noisy chaos between the dreamy hooks. The best one comes after "Insubstantial," or as I like to think of it, "the first song on side two." It's an upbeat little number that melts into noise marked by a particularly abrasive caterwaul from the guitar that whines and whines and whines and gets under your skin. Then the slow bass line intros "A Deep Sleep for Steven" which is all shimmery guitars and voices, with the only percussion appearing on every fourth beat in the shape of a loud thudding drum. The album also includes a cover of "Fell From the Sun" which I think Kendra Smith wrote for her pre-Opal band Clay Allison. It too has some great picked chords with lots of echo, and it climaxes in an echoey sea of Ian Masters's voice again. Comforts of Madness was one of those albums where the song titles were never listed in the order that they ran, so there are still some songs whose titles I always forget, at least at first. This is a 32-minute free improv blow-out which, if I remember correctly, gets a little busy at times, with four horns, bass and drums getting totally out. I had to pull it out again and listen to it, because there's something I like about very long pieces like this. This disc is on CIMP, a label lthat prints a statement on the back of all their discs about how the CD shouldn't be played as background music, but as if there's a concert going on in front of you which you should give your undivided attention. I can sort of understand what they're getting at, because free jazz shouldn't be for casual listening. I wonder what they'd think about my thought that it's easier for me to pay attention to music while I'm driving than it often is when I'm at home. Regardless, I'm playing this CD and I'll be damned if I can remember what I want to talk about. I had kind of been hoping to spend my Christmas money on the Mosaic box of Miles at the Blackhawk, which is the vinyl edition of the CD set of his quintet with Hank Mobley when they played at that club. Then in January, Mosaic sent out a message that they were running low on that Miles box. I didn't take any action right away, and now it's gone. Out of print. Sure I could buy it on CD, but there's something about owning a six-record Mosaic set. It's kind of the same appeal as a 32-minute free jazz excursion: monumental and entertaining. A couple weeks ago I found that John Vanderslice is coming to the Warhol on April 11. And I was ecstatic. He hasn't been here since about 1996 when MK Ultra played with the Pundits at Luciano's. I've been anxiously awaiting John's return since I got completely immersed with his solo career around the release of Cellar Door (I had some catching up to do). Then, I found out last night that the New Pornographers are coming to town.......ON THE NEXT NIGHT?!?!? Could this really be true? My little head is going to explode! What's next, Big Dipper will decide to drop by Pittsburgh for brunch on Sunday? Big Dipper is getting back together for a few shows in late April to mark the release of Supercluster, a collection of their Homestead releases and some later, solid, unreleased stuff. I interviewed Gary Waleik from the band on Monday night. Me and him go way back. 20 years in fact. When Dipper came to the Decade in 1987, I was one of about seven people in the audience and I put them up for the night. That was about 2 months into life in my first apartment, and one month into a relationship with a new hipster girlfriend. The relationship died two months later, as did the fun of the living situation, but Big Dipper never let me down.